The difference between a strong player and a weak player is what they do after a poker session. Weak players play poker hands and forget about them. They put themselves in tough spots and fail to make adjustments based on past mistakes. Strong players look back on their poker hands. They analyze spots thoroughly and try as hard as they can to eliminate leaks from their game. Once a strong player finds a leak, they plug it in preparation for the next time a similar spot arises. Today I’ll show you a short and practical 5-step routine that you can use to analyze your poker hands. You can use this routine to study after a session, to warm up before a session, or whenever you feel like doing some productive off-table work. From there, I’ll share an advanced method for analyzing poker hands from a theoretical perspective (written by fellow Upswing writer and Lab member Thomas Pinnock), which will help you identify leaks in your overall strategy. Click here to jump straight to the advanced method. It is imperative for any poker player who takes the game seriously to record their hand histories. Of course, this isn’t really possible for live players, but live players ought to write down especially notable hands to study afterward. For online players, there are multiple programs that can do that for you, such as Poker Tracker, Holdem Manager, Hand2Note, etc. So, whatever your situation, you should have a method of keeping track of hands played. Format your hand histories the same every time so they’re easy to read, especially if you post them on public forums. A clean, consistent format will usually result in more strategic feedback. While you’re preparing a hand history, try to identify the tough spots in the hand–the ones most in need of analysis. Hero calling preflop, on the flop, and on the turn are trivially easy decisions, but the river is questionable. So, in this case, we want to find out if we have enough equity to call on the river. We need to call 28 BB to win 56 BB on the river, which means we need to win 33% of the time versus the Villain’s river betting range (learn how to calculate pot odds here). I prefer Flopzilla because it has some extra features, so that’s what I’ll use in this article. Editor’s note: We’ve used red boxes to highlight the relevant info in each Flopzilla image for those of you unfamiliar with the program. Does calling on the river seem far too loose? Or does it seem like a snap call? Make a mental or physical note about what your intuition says about this spot. In this case, the Optimist assumes the Villain value bets a normal amount of hands and bluffs with everything that missed. As a result, he has a fist-pump snap-call on the river with over 64% equity. This value betting range is the same as the one the Optimist came up with, but the bluffing range is limited to the best blocker combos, namely, QT. Even in the worst case scenario we still have ~31% equity. Things are already looking very good. When the Pessimist gets such a favorable result, I don’t bother analyzing the hand through the Realist’s eyes, because it will also be favorable. But for the purpose of this article, let’s see what the Realist thinks. Realistically, I believe my opponent will continue bluffing with all the backdoor flush draws, and all Qx and lower hands that missed and were not flush draws on the flop. We can see that we’ve got far more than enough equity (40.68%) to call in this spot. After your hand analysis, be sure to take notes regarding the differences between your initial presumption––which is typically optimistic, in my experience––and the realistic result. This will help you improve your intuitive strategy over time. Poker hobbyist Shaun Densmore turned a $7.50 buy-in into $94,901 after studying in the Lab. What will you win? Learn what propelled Shaun to his big win and take your poker skills to the next level when you join the Upswing Lab Learn Expert Strategies Today & Start Crushing Tomorrow! Hand analysis is the bread and butter of your off-table work, and repeating this quick method will undoubtedly make you a much stronger player. If you are serious about getting better at poker, I think you should analyze at least one hand every day to keep your skills sharp and your trajectory upward. Now, let’s take a look at an advanced method for analyzing hands from a theoretical perspective. Unlike the 5-minute method–which helps you find the best play in a vacuum–the following method will help you find the best play as it pertains overall strategy. If you want to figure out the theoretically sound way to approach a situation and/or identify leaks in your overall strategy, this section is for you. We’re about to go over two techniques: one for when you’re attacking (betting or raising) and one for when you’re defending (facing a bet or raise). I’ll break down techniques for both in this article, and look at a hand example from both players’ point of view so you can see them in action. Once you master these techniques, your confidence in tough spots at the table will soar. Minimum defense frequency (MDF) is the frequency at which you need to continue when facing a bet in order to make Villain’s zero-equity hands indifferent to bluffing (see: this article on minimum defense frequencies and pot odds). In other words, MDF is the fraction of your range that you must continue with when facing a bet to prevent Villain from profitably bluffing any two cards. For example, if Villain bets 75% of the pot, your MDF can be calculated to be 57.14%. So you need to continue with roughly 57.14% of your range against this bet to prevent Villain from being able to exploit you by under- or over-bluffing. Pot odds help you decide how often you need to bluff to make your opponent’s bluff catchers indifferent to calling your bet. In this sense, pot odds are related to the frequency at which you bluff when you make a bet. For example: if you bet 75% of the pot on the river, the pot odds that Villain is getting on a call is 30%. This means that Villain needs to be right 30% of the time to call with his weakest bluff-catcher. In essence, you can reduce the EV of Villain’s decision to zero by bluffing exactly 30% of the time – Villain will not be able to exploit you by over- or under-folding to your bet. Let’s work backward to determine the optimal frequencies on the turn and flop (assuming the same 75% pot bet size). 30% of your betting range on the turn needs to give up on the river, while the remaining 70% will bet on the river. If 70% of the hands that you bet on the river are value hands, then the proportion of your hands which are value bets on the turn are 70%*70% = 49%. Repeating this process for the flop (49%*70%), we see that the proportion of value hands on the flop is 34.3%. …while giving up with an average 30% of our range on each street. This assumes our bluffs have no chance to win when called. If our bluffs have equity, however, we can get away with bluffing more often — value betting less frequently than the numbers calculated above. This accounts for the fact that our bluffs have a chance to become value bets on later streets. Note: Are you happy with your poker results? Start crushing your competition with strategies that flat-out win when you join the Upswing Lab. Learn more now! Let’s use MDF and pot odds to analyze the following hand history from both players’ perspectives. We’ll start with the player in the big blind. Hero checks, CO bets 3.75BB, Hero…? We see that our range has only 47.01% equity, meaning that we are at a range disadvantage. As a result, it is fine for us to fold slightly more hands on the flop than as required by our MDF. Otherwise, we will end up with too weak a range when we get to the river and we will be forced to overfold then. We choose to continue with 188 combinations out of the 354 pre-flop combinations that we started with. This represents a 53.11% defending frequency. Given Villain’s range advantage (and for the sake of simplicity), we will continue our entire range as a call. Strong hands that could conceivably be check-raised, such as 66 or ATo, will remain in our calling range to prevent Villain from over-betting aggressively on later streets. Hero checks, CO bets 9.38BB, Hero…? The 2♠ is a brick. It doesn’t help many of CO’s bluffs and only brings a backdoor flush draw. Against this 75% pot bet we choose to defend 110/187 combinations = 58.82% of our range. Our weakest Tx hands without a flush draw can be folded. Our gut-shots are now too weak to continue without the flush draw – the only draws that are strong enough are 9s8s, 9s7s, 8s7s. You might choose to check-raise these draws, along with your set of 66, because of their low showdown value and high draw strength. For the sake of this example we will continue with these hands as a call. Hero checks, CO bets 23.45BB, Hero…? The river is the 3♣ bringing the backdoor straight but bricking the backdoor flush. Here we need to fold all of our Tx and some of our weakest Ax. We choose to defend 63/109 hands = 57.8% of our range. First we need to make a plan of attack. For the sake of this example, we can choose a simple attacking strategy of betting three streets with our value hands for 75% of the pot on each street. The question then becomes: what are our value hands? To figure this out, we need to consider all of our hands and their equity against the hands that we expect Villain to call all three streets with, given relatively blank run outs. From our analysis of the BB above, we see that Villain needs to call down with most of the Ax in their range. We can map out the equity of all of our hands against Villain’s three street continuing range in Power-Equilab. Using all Ax+ from the Upswing Lab‘s recommended BB vs CO range, we see that the weakest hand that has more than 50% equity against this range is A9o with 56.5% equity. For the sake of this example, we will check back A9 on the flop and go for three streets of value with AJ+. Counting the number of hands in our range, we see that we have 451 combinations after card removal from the board. Our value range is 58 combos, or 12.86% of our entire pre-flop range. From this we can calculate the minimum number of bluffs we need if we choose to bet 75% of the pot on all three streets. When selecting bluffs, we look to choose hands with good draw value and/or low showdown value. One of our best bluff candidates is 98o – it has 4 outs as a gut-shot straight draw to the nuts but will almost never win at showdown. 84s is another good candidate as it has no showdown value. 6x hands are reasonable bluff candidates for a few reasons: it has 5 outs to two-pair or trips, can put pressure on stronger pairs, get called by draws, and fold out up to 30% equity from over-cards to the pair. Here we choose to bluff 159/451 hands = 35.25% of our range. When we bet, our value betting frequency is 58/(58 + 159) = 26.7%. You might think that this is low, but remember that our bluffs have good equity and we have range advantage so our flop bluffs will be slightly more profitable. The 2♠ is a brick for our range. The only bluff that improved to value a bet is pocket deuces. However, we do pick up some backdoor flush draws and some more gut-shot straight draws with 54s/53s/43s. This value range is 61/213 hands = 28.64% of our flop betting range. To balance this, we need to choose some bluffs so that at most 49% of our turn betting range is value hands. Knowing this, we calculate that we need at least 63.5 combos of bluffs to balance our 61 value hands. 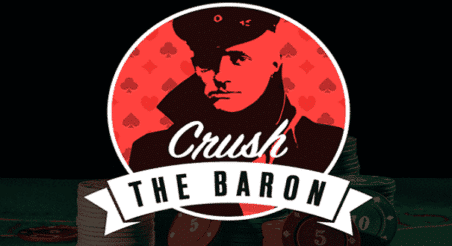 Taking a look at our bluffs, we need to pick hands to give up or we risk over-bluffing. Combinations like 33-55 or 8♣4♣ can be checked back looking to give up on the river because they have very little draw value. Hands like KQ have 4 gut-shot outs along with the 6 outs to 2nd pair which might win at showdown. However, if we bet the turn, Villain’s continuing range shrinks to roughly JT+, meaning that the 6 outs to 2nd pair will no longer be good enough to win the pot. 32s picked up a weak pair, and we can use the 5 outs to two-pair or trips to barrel turn. 54s/53s/43s can also use the extra equity from the gut-shot to continue bluffing. We will also continue bluffing with all of our backdoor flush draws. We continue bluffing with only our weakest 6x because our stronger 6x may still win the pot at showdown if checked back. We’ve decided to continue with 68 bluff combinations = 31.92% of our flop betting range. We’ll check and give up 84 combinations = 39.44% of our range. This is higher than the give up proportion of 30% that we we’re aiming for, but this is a result of getting ‘unlucky’ on a brick turn card. The 3♣ is a good card for our range. We make the nut straight with 54s and some two-pair hands with 63s and 32s. This gives us a total of 69/125 combinations = 55.2% to value bet. When betting 75% pot, we need to bluff at most 30% of the time to make Villain’s bluff-catchers indifferent to calling. Since our bluffs have no equity, and Villain’s continuing range will block some of our value range, we cannot bluff more than 30% of the time and still remain balanced. When selecting bluff bets on the river, we choose hands with the lowest showdown value and/or hands that significantly block Villain’s continuing range yet do not block the folding range. Here we bluff all hands 9-high or weaker for a total of 29 combinations, meaning our bluffing frequency when we bet is 29/(29 + 69) = 29.6%. That’s all for today! As always, if you have any questions or feedback don’t hesitate to use the comment section down below. Gain access to 57 learning modules (covering topics like multiway pots, overbetting, and more) and 139 Play & Explain videos when you join the Upswing Lab!